This list of frequently asked questions are primarily related to the ‘Physical Therapy Web’ site, though some general physical therapy questions are included as well. The questions are compiled from those that have been sent in over the years. If you have a question that doesn’t appear in the list, please feel free to contact us. I’m interested in a career in physical therapy. How do I get started? Check out our ‘Becoming a Physical Therapist‘ article. It contains information on what it means to be a physical therapist and what to do to get into a physical therapy school. DPT means ‘Doctor of Physical Therapy’ or ‘Doctor of Physiotherapy’. The DPT first started in the United States in 1992 as a “transitional” degree for individuals who already had physical therapy degrees. It is now offered in its non-transitional form in the United States and many other parts of the world. Physical Therapy schools are transitioning to exclusively DPT programs. Where did this site get it’s original name ‘Physical Therapy Web Space’? The name ‘Web Space’ was actually intended to be a clever play on words. While studying for gross anatomy class back in physical therapy school I came across the term ‘web space’ in reference to the area of skin between the fingers, particularly between the index finger and the thumb. At about the same time I was creating the original incarnation of this ‘web’ site and thought the name would be an appropriate and amusing double entendre. Unfortunately, it seems I was the only one to think so. 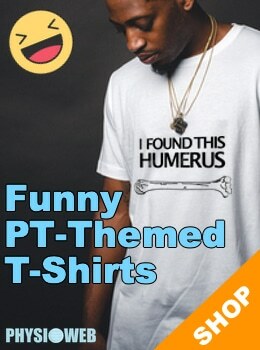 Either nobody else in the physio world picked up on the connection or everyone thought the joke to be too lame to acknowledge. Not very clever at all I suppose. Regardless, the name has stuck. Can I post a job opening on this site? No, we do not currently accept job openings on the site. Can I post a resume on this site? At this time we are not accepting resumes from physical therapists. We will consider maintaining a database of user resumes if there is enough demand. Please contact us if you would be interested in such a service. Can I request that you list my site on Physical Therapy Web? You certainly can, and are encouraged to do so. On each page of links there is a form at the bottom for suggesting links. Please use this form for submitting your site from the appropriate page. We do request that you provide a reciprocal link back to this site from yours. AAROM is an abbreviation for Active Assisted Range of Motion, a term commonly used by physical therapists to refer to physical movements through the normal or available range of motion with assistance. The assistance can be provided by a therapist or by the patient themselves through the use of devices, such as towels, pulleys or other assistive device. AAROM is an abbreviation for Active Range of Motion, a term commonly used by physical therapists to refer to physical movements through the normal or available range of motion with assistance. The assistance can be provided by a therapist or by the patient themselves through the use of devices, such as towels, pulleys or other assistive device. AROM is an abbreviation for Active Range of Motion, a term commonly used by physical therapists when referring to the range of movement through which a patient can actively (without external assistance) move a joint using the muscles adjacent to the joint. PROM is an abbreviation for Passive Range of Motion, a term commonly used by physical therapists when referring to moving a body part through it’s available range without the activation of the patient’s muscles. The movement itself is performed by an external source such as a physical therapist. Varus refers to an inward angulation of the distal segment of a bone or joint. For example, a person with both knees with varus would is sometimes referred to as ‘bow-legged’. Valgus refers to an outward angulation of the distal segment of a bone or joint. For example, a person with both knees with valgus is sometimes referred to as ‘knock-kneed’. HEP is short for ‘Home Exercise Program’. View our list of Exercise Prescription Software often used for creating home exercise programs. Bursitis is the inflammation of a bursa, typically one in the knee, elbow or shoulder. A bursa is a fluid-filled sac or saclike cavity, especially one countering friction at a joint. Iliotibial Band Syndrome is a condition in which a person experiences lateral knee pain due to the Iliotibial Band (ITB) rubbing on the lateral epicondyle of the femur, causing local inflammation. The rubbing of the band on the knee is usually considered to be due to tightness in the tensor fasciae latae, a hip muscle that attaches to the ITB. What is the “Coffee Cup Sign”? The coffee cup sign is characterized by pain during simple grip activities such as grabbing and lifting a coffee cup. It is typically present in people with lateral epicondylitis, otherwise known as Tennis Elbow.